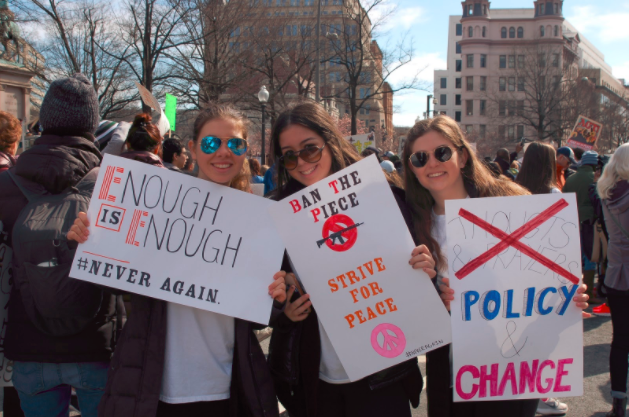 (Photo courtesy of Gillian Wolf) From left: Gillian Wolf, Zoe Offir and Julia Rubenstein hold signs while attending the March for Our Lives student rally in Washington, D.C., on March 24. Four students reflect on their experiences, motivations and feelings after each attending March for Our Lives gun control rallies in Washington, D.C., and New York City on March 24, 2018. Gun violence is a horrible issue that takes place in our world daily. Of course when I see things on the news about these types of issues I become sad and sympathetic for the people involved. But then time goes by and I continue on with my life. For me, the Parkland shooting was not like any other shooting. My best friend, Leni Steinhardt, her brother, Eli, their friends and numerous people from my previous camp, Silver Lake, were in the building. Knowing people personally in the massacre was devastating and traumatic for me. It is scary to think, but it can happen to anyone and I couldn’t really comprehend that until it happened way too close to home. I am a person who likes to take action, so of course I jumped on the idea of putting together something for our school. While I was proud of the walkout that I helped organize at West Essex, I still needed to do more. As soon as I found out March for our Lives was happening, I knew I had to go; I felt like I needed to. It was a way for me to get involved, show my support and express to people that this issue is not be taken lightly and won’t ever just be another horrible shooting in my eyes. It is an unimaginable feeling to be shoulder to shoulder with hundreds of thousands of people while making history. I am truly amazed how many people attended the march and how impactful the students all around the country were. These courageous people from Parkland and around the nation are not giving up without a fight and they have my full support. They have opened the eyes of thousands of people and created a nationwide community that is ready to join them in making a difference. I believe this march won’t be the last, and it is just the beginning of a long journey that I am ready to help out with. When people see a school shooting on the news, they think that it will never happen to someone they know or even their best friends. Feb. 14 was the scariest day for many people that were in Marjory Stoneman Douglas High School and for people all over the country. Before the Parkland shooting, I was always terrified when they would call a lockdown because I would instantly think the worst. I would start tearing up. When I heard about all of the marches, I knew I had to go. People need to realize that this has been a problem since Columbine in 1999 and Sandy Hook in 2012 and something needs to happen. I went to D.C. to make a change. I wanted to go because I knew I had to support all my friends that live in Parkland and have my voice heard. I was so inspired by many people that went to the marches to make gun control stronger. I know that this is not going to be the last or the end; it is the beginning, and the movement is going to live long until gun laws are stricter. The government and adults around the world have messed with the wrong generation because we can make a difference in the world and no one can stop us. No one ever thinks that something like what has happened at numerous schools in the United States will ever happen to them or to someone they know and love, until it does. On Feb. 14th, 2018, my best friend Leni Steinhardt became a witness to a school shooting. Her brother, Eli, who was in the ninth grade building, became a witness to a school shooting. Many people who I have met because of Leni became witnesses to a school shooting. People I have never met also became victims of the Parkland shooting, and their school will never be a safe place for them ever again. Despite everything that has happened to these students, they have chosen to take their pain and anger and turn it into something good; they are actively changing the world. Daily they are talking to representatives and demanding change regarding gun laws. They have organized national school walkouts and rallies and they have been interviewed countless times and they have sung for themselves and their peers on international television. They have also become an inspiration for other schools to participate and be active in the cause. When I first heard about the marches on March 24, I knew I needed to be there. It didn’t matter if I went to D.C. or NYC or if I even stayed in New Jersey and went to Morristown — I just knew I needed to be there, to support my friends and all of the other victims of not just the Parkland shooting but of every school shooting ever. Seeing all of these people join together to demand change made me really proud of myself, my friends and everyone who is trying to change gun laws to prevent this from ever happening again. My experience at the NYC March For Our Lives began before I was even in the city. While waiting for the bus at the Willowbrook Mall, I met groups of other people all headed to the march as well. Everyone was holding a sign and excitedly chatting with others about the day ahead. I spent a large part of the bus ride discussing the march and the impact it could have on the country with a fellow passenger. She was much older, and was so proud and amazed at the impact the Parkland students have been able to make. When I arrived at the march, I was pleasantly surprised that to my surprise (and delight) the massive number of attendees meant that I was told to enter at 81st street, as opposed to the advertised 72nd street. Even the streets that were not officially blocked off for the march were filled with people on their way to the event. When eleven o’clock finally rolled around, it was time for the speeches to begin. Speakers included a student from Marjory Stoneman Douglas, as well as victims of gun violence across the country. The song “Shine” written by Parkland students after the shooting was performed. Never before have I seen such a large number of people remain this silent. Kids clung to their parents, friends locked arms, and tears rolled down faces. The march itself began a little after noon. Although it was a long route, the sensation of high energy never wavered. Signs were always high in the air, and chants only increased in volume. Along the route there were also people in support of the March For Our Lives cause who chose to protest in their own way. It was lined with people cheering us on and holding up signs thanking us for marching. One of the most notable signs of support was at a preschool whose building was at the beginning of the march. Through the windows, there were young kids waving at us and holding signs against the glass. This type of support was found throughout the entire march, along with news reporters, cameras, and the occasional helicopter. The highlight of my day was a group of little kids who decided to lead their own cheer. Inspired by the “call and answer” type cheers others had been giving, they shouted “Tell me what democracy looks like”. Everyone immediately joined in on the response of “This is what democracy looks like,” and the resulting smiles that lit up each child’s face could melt the heart of even the toughest NRA member. The sense of camaraderie I felt while at this march gave me a reason to believe that we could make real change. The crowd was just as packed at the end of the march as it was in the beginning, and throughout NYC the rest of the day I would see fellow marchers with their signs. I came home that day tired but excited for change: Excited and proud to be a part of this movement, and excited for what my generation had been able to accomplish and all the people we were able to touch.